Hungry to grow your restaurant? Introducing Hungry Wheels, the greatest F&B growth platform. Introducing, India's only approved mobile restaurant platform by Hungry Wheels, a smart and easy channel to grow your restaurant business. 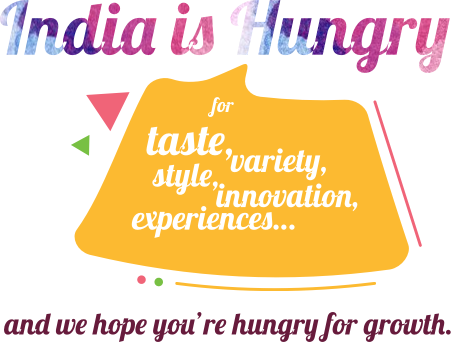 We've unlocked a revolutionary new future for you and the F&B industry in India. You can now own a Hungry Wheels mobile restaurant with legal 'Parking Permits'. To operate in the prime location's with very-high footfalls in your city, during peak business hours or on a weekend evening, at a very, very low investment. It's possible now! After 6+ years of rigorous research, scientific design and development and business model innovation since 2012 we bring to you a smart, ergonomic, and contemporary concept which is the need of the hour ‘restaurant on wheels’, designed for serious growth of serious restaurateurs. 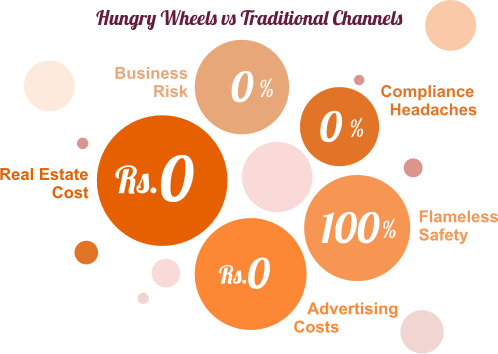 The Hungry Wheels mobile restaurant platform comprises of their proprietary vehicle design, which comes fitted-out with FSSAi compliant infrastructure (M.E.P.) and interiors, with fully customisable modular kitchen layouts. The Hungry Wheels platform also has numerous layers of innovative services, solutions and features that resolves multiple issues of starting and growing your Restaurant. It allows you to concentrate on your cooking magic while we manage all the headaches around it, so you catch your customers where they are, when they are... HUNGRY! We invite you to come take a closer look at what is in store for you to take your kitchen magic out for a walk in the park, literally! Hungry Wheels is built, run and managed by a select ex-servicemen team from the Indian Army. With competencies and a passion for innovation, manufacturing, design, technology and operations, we have invested our time in understanding the restaurant business problems and bottlenecks, which has helped us in building a complete platform to grow your restaurant business. Hungry Wheels is Designed in India, Made in India.